HIROSHIMA, Japan - Japan scored five runs in the first two innings and rode them to a 5-2 victory to take a 2-1 series lead over the USA Baseball Collegiate National Team. South Carolina's Grayson Greiner had two hits and an RBI in the loss. "Obviously it's not the result we wanted, but you have to give every ounce of credit to Japan's team," remarked manager Jim Schlossnagle (TCU). "They pitched outstanding, played great defense and got timely hits." Vanderbilt's Tyler Beede (1-1) took the loss for Team USA after allowing four runs on two hits and three walks in 1/3 of an inning. Matt Imhof (Cal Poly) held Japan to a run on five hits over 6 2/3 innings. He walked two and struck out six. Riley Ferrell (TCU) retired all three batters he faced in the eighth. A trio of walks in the first inning spelled disaster for Team USA as all three came around to score. Ryutaro Umeno gave Japan a 1-0 lead with a double and a bases loaded wild pitch pushed the lead to two. Hiromi Oka legged out an infield single to drive in the third run of the frame. Imhof came on and stemmed the tide, retiring the two batters he faced. Masataka Yoshida beat the relay throw to first base on a potential double play ball to make it a 4-0 game. Japan's lead grew to five in the bottom of the second as it took advantage of a lead-off single from Hiroki Minei. He was standing on second with one out for Ryo Miki, who singled to right to drive in the run. Imhof bent but didn't break in the middle innings as he worked out of a trio of jams to keep the deficit at five. He worked around a fourth inning jam that saw Japan draw a one-out walk followed by a base hit. Michael Conforto (Oregon State) hauled in a sinking line drive for the second out, then Imhof picked off the runner at second to end the frame. Japan tallied a two-out double in the fifth, but Imhof's fifth strikeout of the game ended the inning. In the sixth, a lead-off error and a two-out walk were stranded. After totaling just three base runners in the first six innings, Team USA's bats came to life in the seventh. Kyle Schwarber (Indiana) reached on a lead-off single. A one-out base hit by Bradley Zimmer (San Francisco) put runners on the corners. Greiner got Team USA on the board with a bouncer up the middle to drive in Schwarber. Taylor Sparks (UC Irvine) followed with a base hit through the left side to make it a 5-2 contest. Japan went to the bullpen and Yasuaki Yamasaki got an inning-ending 4-6-3 double play. The combination of Yamasaki and Kenta Ishida held Team USA to just one hit in the final three innings. Yamasaki retired six of the seven batters he faced, while Ishida struck out the lone batter he faced to lock up the win for Japan. 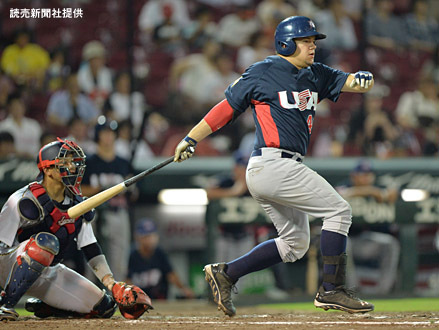 With the victory Japan took a 2-1 lead in the 39th edition of the USA-Japan Collegiate International Friendly Series. Team USA drops to 12-2 on the summer. The teams will take a day off for travel purposes as the series shifts to Utsunomiya, Japan. Game four is set for Wednesday at Kiyohara Stadium with first pitch slated for 5 a.m (ET)/6 p.m. (JST).